Some people still believe that hospital is not a right place to find charity or consolation. Well, we can’t blame anyone for thinking this because most hospital still treat their patient as someone who suffer a disease who needs to be treated immediately, not as someone who need help to build a better and healthy life. Most hospitals make an impression for themselves that a place where patient will get treatment is specially built for sick people, not for people who find hope, spirit, and support for their life. Most hospital still treat their patient as object to their treatment, not as a precious subject. Some hospitals try to give something different to their patient. One of them is St. Borromeo Hospital at Bandung, West Java, Indonesia. As one of the largest private hospital in West Java, this hospital tries to give the best to their patients, one of them is by making the hospital as a special place for everyone, not only the patients, but also for everyone who visit the hospital. If you come to the hospital, you can find a nice chapel located behind the hospital. Even though this chapel is actual not belongs to the hospital, but to the religious congregation which runs the medical service, this chapel still become an actual proof for everyone, especially patients who are being treated in the hospital. Built in 1925, this chapel has become part of everyone’s life, especially patients. Realizing its important role in being a special place for everyone, in 2012, local government finally made the chapel area as local heritage. Even though this policy means there will be no development regarding area expansion, still there will be many people who will get benefit from the chapel. Since it has been considered as local heritage in West Java, I think it is good for us to know a bit deeper about this chapel. This chapel was built in 1925 which means far before Vatican Council II. This means you can see traces from Latin Mass inside this chapel as well as how the chapel was built in the past. It is also very easy to know that this chapel is consecrated to the Blessed Virgin Mary. You can easily find her title from windows panels spread both at the left and right side of the chapel. There is maybe 1 thing that you can find at other Baroque-styled churches, but you can not find at this chapel. It is the large organ which is missing from this chapel. However, it will not change your perception about how good this chapel is. In addition, you can find a dome in the northern side of the chapel where 2 altars placed. In general, this chapel adopts Baroque style nicely without disobeying local culture which you can see at the external structure of the chapel, paint using and many more. 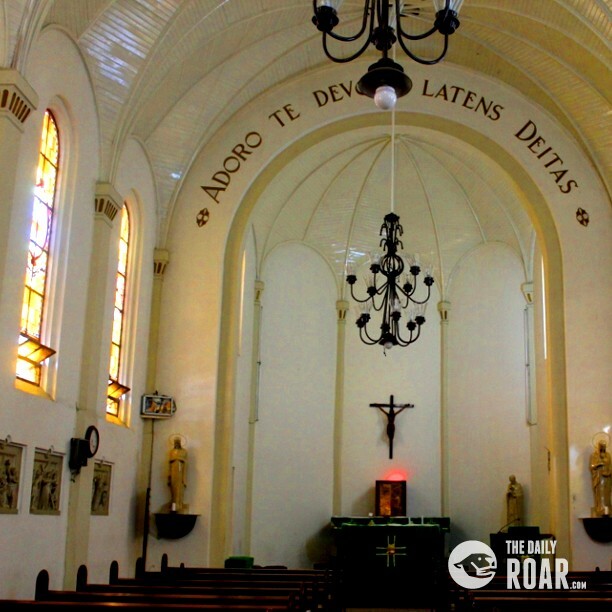 Overall, this chapel is a nice place where you can pay a visit when you come to Bandung.